Today’s education is about the transfer of information or training. Engaging students with content and connecting students with information has never been more important. Getting content from one place to another can be challenging, but it has never been easier than with today’s technology. Technology continues to play an increasingly larger role in education and in the workplace. Content comes in many forms such as pictures, videos, recordings, computers, transcripts, podcasts, Google, YouTube, etc. and needs to be brought into the classroom at just the right time. Today’s interactive displays can serve as the hub of today’s classroom and can deliver a dynamic learning experience for today’s student. Students learn in more than one way, so why shouldn’t we teach them in more than one way? 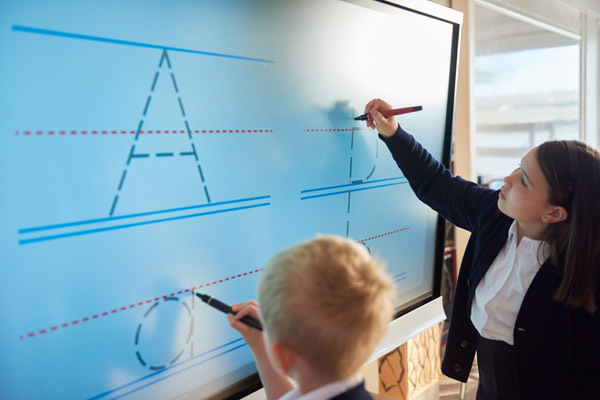 Blending the right technology with the right furniture can give the teacher and the classroom the flexibility to deliver powerful lessons and experiences. With all the choices available, it can seem overwhelming without a partner who can help simplify today’s options. Partner with Schiller’s for a common sense approach to lifelong learning and teaching in all education spaces.